The author draws on half a century of experience in general policing, CID investigations, specialist wildlife crime investigation and criminal intelligence work to analyse and expand on wildlife crimes and incidents occurring right across the UK and reported in the media and on social media. He narrows the range to concentrate on cruelty to wild animals, such as fox hunting, hare coursing and crime committed against badgers. The main part of the book analyses crime associated with game management, especially that relating to intensive driven grouse shooting, and included is a chapter on the valued assistance in some police investigations by experts with relevant skills. Is foxhunting pest control or simply a nice day out for garishly-dressed people on horses? What cruelty is involved? What is happening to the satellite-tagged hen harriers and golden eagles that have disappeared? Why is evidence obtained by covert surveillance by non-government organisations frequently disallowed by prosecutors or courts? Should shooting be licensed or should driven grouse shooting simply be banned? Who are the main people behind raptor persecution? How can rich landowners avoid prosecution? With all of these questions is the relevant legislation working? What, if anything, is being done to improve the situation? All of these, and more, are discussed in depth by an author who has experienced the complexities of these investigations. The cover photo of the book is by renowned wildlife photographer Laurie Campbell and is of a female hen harrier about to take a chick offered as diversionary feeding at Langholm Moor. There are 16 pages of colour photographs elaborating on some of the content. Alan Stewart’s account of a year walking a Highland Perthshire farming and shooting estate demonstrates that a vast range of wildlife can thrive where conservation is embraced within land management. The book is a culmination of a lifetime’s knowledge of wildlife, the author guiding the reader into the secret lives of the birds and animals in his native Perthshire. His country lore allows him to watch a hunting goshawk and a sleepy tawny owl after being alerted to their presence by other birds; you can almost hear the songs of birds such as mistle thrush, lapwing and common sandpiper. There are vivid narratives of encounters with less commonly seen birds such as the white-tailed eagle, snow goose, crossbill, green woodpecker and garden warbler. The author has close assignations with mammals such as fallow deer and red squirrels and follows the fascinating trail of a hunting fox in the snow. In Scotland we have a plethora of legislation protecting a diverse range of animals and plants plus habitats of special interest. Some of the legislation is very old and much of it is very complex. Wildlife & the Law spells out chapter and verse in an easy-to-follow text and numerous colour photographs. As well as wildlife law, it includes separate chapters on cruelty to domestic and captive animals, a brief chapter on offences relating to dogs, and one on offences committed against Sites of Special Scientific Interest. 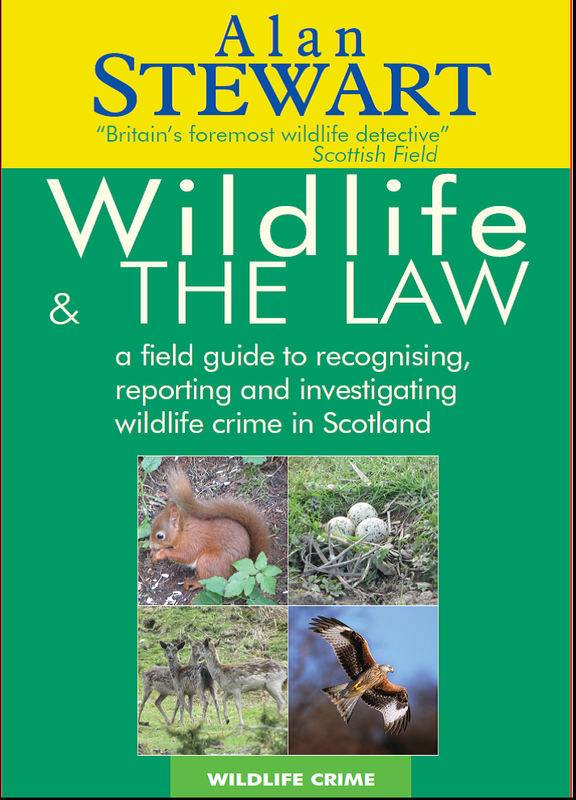 The book, in essence a field guide, is designed in part to help prevent wildlife offences being committed, though where prevention has failed the well-indexed contents should help the reader recognise the offence and respond. • Property owners, developers or even householders who might have concerns with nesting birds or bat roosts. Following on from Wildlife Detective, A Lone Furrow continues to reveal the specialisation required in obtaining a conviction in crime committed against birds and animals that cannot give evidence on their own behalf. The detailed police investigations show the meticulous work that police wildlife crime officers carry out to try to prepare a case for prosecution, the range of organisations that they can call on to assist, the successes, and of course the frustrations. The author is in no doubt that some of these crimes are the most challenging in over 45 years of policing, but the investigations are thoroughly explained in a manner which is often humorous and sometimes even self-deprecating. Amusing and amazing anecdotes from the author’s early police career are merged with wildlife cases and illustrate the breadth of experience required of a police officer. With suspects ranging right across the social spectrum, public expectations often unrealistic and victims ranging from salmon to seals; guinea pigs to golden eagles; hedgehogs to hares; pearl mussels to peregrines, this book is a unique insight into the enforcement of wildlife law. From the author of the bestselling Wildlife Detective a unique book which presents a wide-ranging survey of the scale of wildlife crime in Great Britain and Ireland today – and how the forces of law and order attempt to combat it. With the help of his colleagues in various forces, Alan Stewart, the foremost wildlife detective in these islands, presents fascinating case studies from all corners of Britain and Ireland, and also recounts how the effects of international crime manifests itself on these shores; crimes against wildlife of all kinds, from water voles to elephants, from rare bulbs to Indian tigers. East Anglia: a wealthy landowner and a retired magistrate involved in egg collecting – surely some mistake? South Wales: A sturgeon offered for sale; call in the police or perhaps Her Majesty the Queen? Told with his customary wit and in his own earthy style, Alan Stewart continues his quest to tell tales and expose the vicious criminals that threaten our natural heritage. Wildlife Detective is an insightful and humorous account of over 40 years policing crime committed against various forms of wildlife, from deer and salmon poaching to the poisoning of rare birds, egg collecting, cruelty, the taking of freshwater pearl mussels and much more. Many of the accounts are the stuff of folklore. There is a serious side to the book, which highlights inadequacies of earlier legislation and consequent failures of cases which in the early part of the 21st century resulted in improved legislation. How evidence is obtained isexplained in a logical yet light way, interspersed with hilariously funny accounts of criminals outfoxed, cops wild with frustration and the community’s appreciation of their environment and its wildlife. Wildlife Detective paints a vivid picture of the life and work of one of Scotland’s best known crimefighters … Stewart brings cases from the pages of his notebooks to life with warmth and humour. Transvestite hillwalkers do not often feature in wildlife crime investigations but this one did help enliven what can be a tense and complicated job for a dedicated band of professionals. Alan Stewart has been a key figure in the fight against wildlife crime in Scotland … I can wholeheartedly recommend this book. The book’s tone is straightforward and methodical, as if torn from the pages of his police notebook … there are numerous scenes of comedy stemming from criminal incompetence. There are also staggering accounts of animal cruelty. Within a couple of chapters I was hooked … Narrated in a charming informal style … some wonderful direct quotes from the wrongdoers and even some of the cops, which had me laughing helplessly. 40 years sleuthing have done nothing to dampen his enthusiasm… The author is ever alert, taking time to note the beauty of his surrounding, the birds and birdsong. The book has humour, larger-than-life characters …..his writing rings with the sincerity of his concern. Not quite John Buchan, but close … the sheer variety of wildlife crime as witnessed by Stewart is astonishing.